The products in this post were given by Minted. Ideas and opinions are all mine. Sometimes this world of blogging is pretty damn awesome. Actually, most of the time (even the long, wee hours of the morning kind of time) it's pretty awesome. And when the amazingness meets up with a friend in need then all sorts of super fireworks go off and real inspiration comes through. Enter my real life friend, Kelly. Kelly is a rare talent as a completely joyful, totally intelligent, got-it-all-together kind of gal. For the past many years, she's been inspiring children in her role as teacher, and now she's made a leap. She's started to pursue one of her life dreams of becoming a children's author. And girlfriend is good. Like three-books-ready-to-be-published good. So when she said she was headed to a writing conference in NYC, I asked if I could help. How about some swanky business cards?! I have just the place for you to check out. Kelly and I hopped over to their site to check out the many, many options they had in innovative business card design. 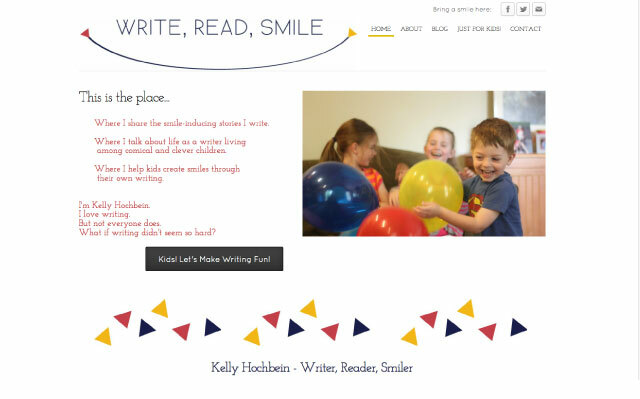 As a writer, Kelly wanted something clean but unique. We discovered this hip Monolith style, available in a variety of colors. It hit the mark. A clear branded touch on one side with a fun pattern on the other and all printed on a super thick paper. And bonus: they come in this class box with a little bit of wit tucked on the inside. Big thank you to the generous team at Minted for gifting Kelly with these incredible first impressions. Check out just how well these cards turned out from Kelly's perspective. Happy for me, Kelly was also willing to let me assist with some basic design for her brand new blog. We used the strong direction from her business cards as a great jumping off point for her blog design. The strong font, the color options, the great use of white space all came into play thanks to the Monolith design. Write, Read, Smile is a fabulous spot for parents and kids that encourages a love for learning all around. There you'll find story starters, great read-alouds, and brilliant recommendations for getting and keeping the young readers and authors in your life interested in words and books. I am so excited for Kelly and all that the future holds. Inspiration can be found all over. If you're looking for great design, check out Minted! And if you're looking for a great read, click over to Write, Read, Smile. I feel really fortunate to be here where I am so thank you, too, for reading and commenting and clicking. It all means so much to me. Every day. Thank you.